Though the theme is athletics related, a couple of other inspirations are visible in the design. 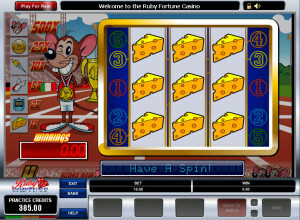 It’s part classic slot machine, part mouse themed since that’s what the hero of the game is, and part sports related since it’s about a competition which takes place on the track. 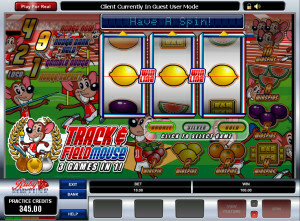 Track & Field Mouse is designed by Microgaming, a developer which offers a range of such titles, with classic layouts but with advanced features. 3 reels and 3 paylines are used in the game, with the features giving the player bonus games, nudges and win spins. The top payout possible in this case gives you $5,000. The slot tries to give you an abundance of features, offering a Brozen, Silver and Gold game in the same title. Depending on which you choose, you get different potential wins and paytable values. You get win spins in the base game, instead of getting paid when you form combinations. You get 1 to 10 win spins instead, which guarantee you that you will win prizes from each one. The new screen, which loads whenever you form a combo in the base game, will show you a mouse that has just won a track competition, with the paytable to the left and the reels on the right. Six different symbols are used in this secondary game, which has 5 lines and awards between 1x and 500x on each one. Despite the presence of 3 paylines, you only need 1 coin to activate the reels of the game and to cover all of them with your wager. The value of the coin is selected from within the range of $0.10 to $10, depending on your budget. A bet that you place in this game will result in payouts of up to 500 times the investment, which means a maximum of $5,000. The game’s design is not exactly modern, but there are a lot of things going on at once on the screen, so it doesn’t feel like a classic title either. You see the track field in the background, with mice being the competitors both on it and in the trials that take place nearby. The symbols are mostly classic ones, the paytable being visible on the right side and underneath the reel area. Symbols: Mouse (10 win spins), Melon (8 win spins), Plum (5 win spins), Two Bar (4 win spins), Orange (3 win spins), Lemon (2 win spins) and Cherry (1 win spin). 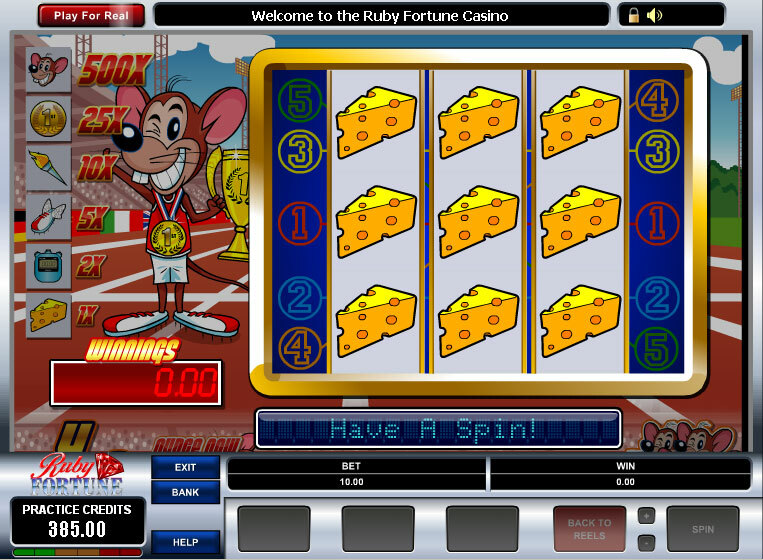 Win Spin Symbols: Mouse (500 coins), Gold Medal (25 coins), Torch (10 coins), Track Shoes (5 coins), Chronometer (2 coins) and Cheese (1 coin). It’s different enough from the competition, it has a theme I haven’t seen anywhere else, plus it uses a different system, where you get guaranteed win spins instead of regular prizes. 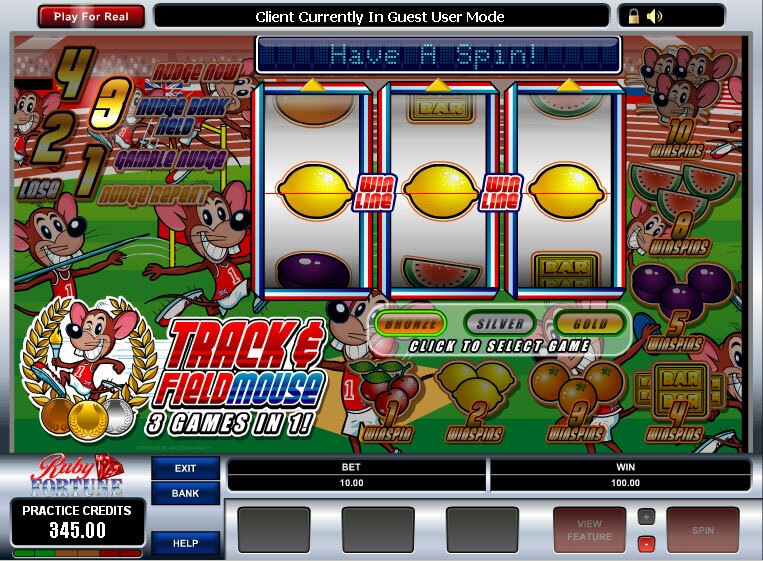 You will find Track & Field Mouse at any online casino which chooses to use software from Microgaming, playable either for free or for real money.